Jeff Ensley may be alive only because a driver on O'Malley Road saw him freezing in the snow last November on the Anchorage Golf Course and anonymously called the Anchorage Police Department. Gary Beagley, a veteran officer, realized Ensley, disheveled and disoriented, needed to get in from the cold. Ensley had been listening to a moose. "I think he was really talking to me, giving me a pointer," he told me. "But I don't think it was safe to follow him into the woods." Beagley is untrained in working with the mentally ill, but has years of experience with the residents of the city's homeless camps. He deposited Ensley in a garage at Providence Alaska Medical Center that connects directly to its seven-bed psychiatric emergency room. Ensley had entered Alaska's disjointed, overburdened mental health system. The psych ER is a dimly lit suite with heavy metal doors, reinforced glass and light fixtures flush-mounted to the ceiling with flat-head screws. ER doctors cover the unit, staffed by nurse practitioners and social workers. They occasional get punched and kicked, said Dr. Dan Safranek, medical director for the Providence Emergency Department. Sometimes a small intake room holds four security guards along with a medical provider giving a forced sedative injection. But Ensley is a gentle soul. He knew he needed to warm up, wash up and stabilize his paranoia and delusions. He checked into Providence voluntarily. His sister in California, Dawn Larue, finally heard he was OK. The ER gives homeless mental patients showers with lice treatment. New shoes and clothing are donated by the community. Safranek said people come in banged up and with swollen hands from the cold. His goal is to stabilize them and send them onward to the right treatment. But much of the time, no treatment is available. Safranek said the ER turns into a waiting facility, with mentally ill patients stranded there for days. If they need drug or alcohol treatment, he can only give them a number to call to get on a long waitlist after they return to the streets. Even when fully staffed, API, the state's mental hospital, doesn't have room to keep patients long enough to stabilize them, said Randall Burns, director of the state Division of Behavioral Health. Patients discharged without effective treatment often return rapidly to ERs. And API is frequently understaffed, sometimes transferring patients considered a danger to themselves or others to facilities located elsewhere in the state, even before they can be evaluated. Anchorage's mental health system — if you can call it a system — is an ad hoc collection of hospitals, nonprofit organizations and individual providers funded by temporary grants or seeking reimbursement through mind-bogglingly complex programs. Without capacity and coordination to address problems, constant crisis prevails and ER resources are wasted. "We have people who bounce between four ERs in one day," said Providence emergency physician Andrew Elsberg." At this point, I don't know if someone has bounced around from ER to ER unless they tell me." 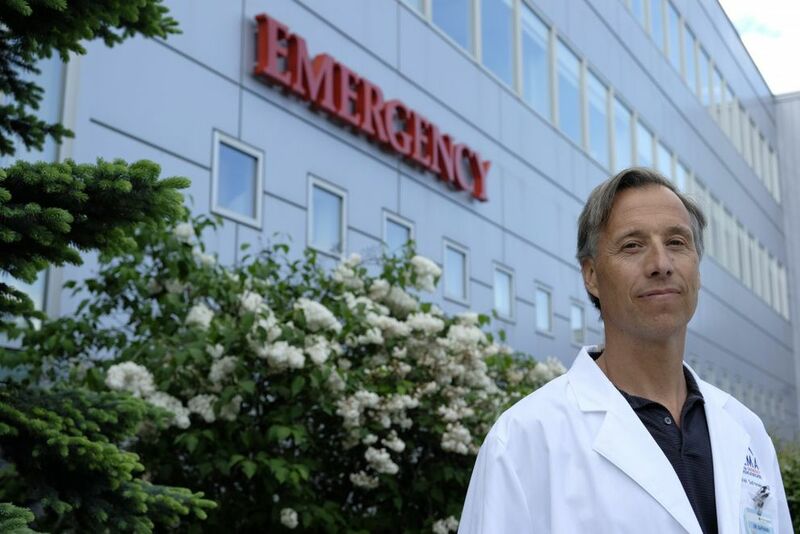 Mental patients often back up into the ER at Providence, and at other hospitals in Anchorage and the Mat-Su that don't have psychiatric emergency services. They get mixed in with patients with broken legs and heart attacks. Doctors told me there aren't enough emergency, in-patient or out-patient psychiatric services. Under federal law, ERs accept everyone. Often, they do what they can for homeless patients and send them on their way. Space constraints push doctors to get patients out the door. But the same people come back over and over. They're well known. A census found 99 seriously mentally ill adults homeless in Anchorage on one day in January, said Nancy Burke, homeless and housing coordinator for the mayor's office. That number is probably low, as the status of being mentally ill was self-reported in the survey. I went with Zachary Hicks to the Campbell Creek greenbelt to look for a seriously mentally ill person in the woods. APD's Community Action Team had found a person who needed help living under a blue tarp by the creek. On a weekday morning we searched for the tarp in the black spruce and mosquitoes off the bike trail near Piper Street. 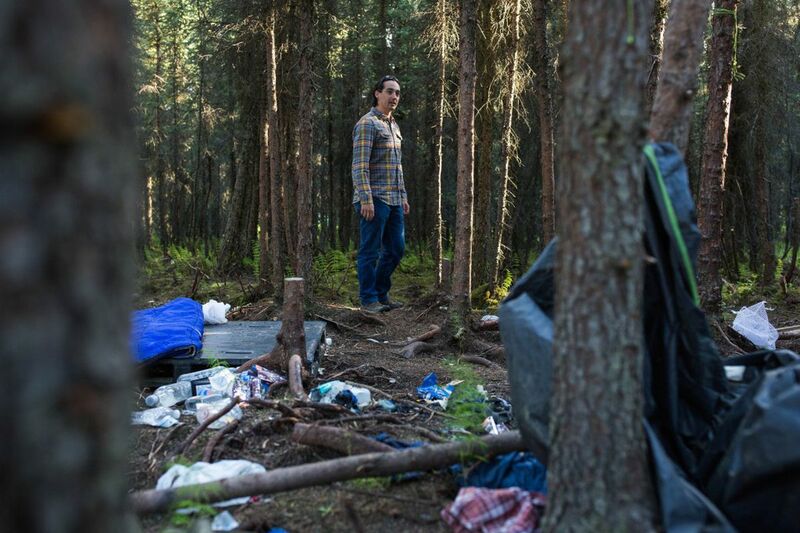 The woods were full of camps — not just one, and not small. 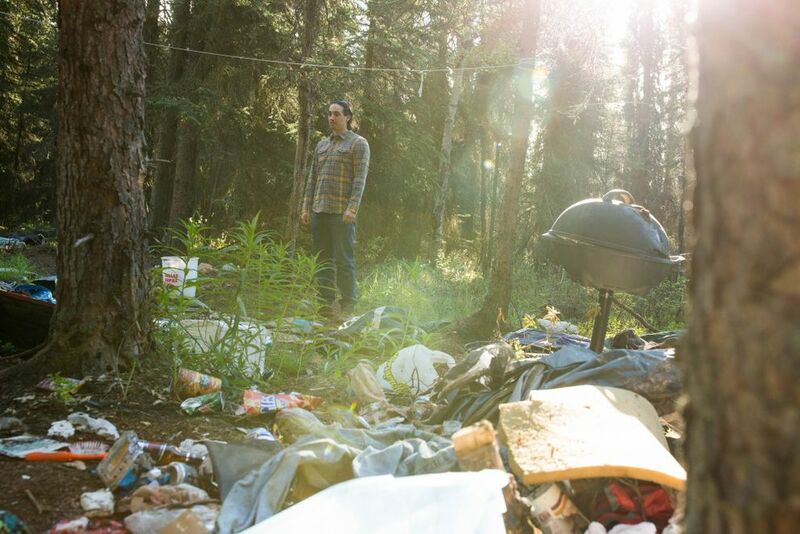 Debris and filth spread in the moss with tents, blankets, bikes, grills, shoes, dishes, gloves, coolers. But no people. Hicks often can't find people he is looking for. At 8 a.m., we had arrived too late. Hicks said homeless campers know to get up early so they can leave without being seen on the bike trail by joggers and commuters who might report them. In the winter, he has found camps awake at 4 a.m.
"They get up to walk around just so they don't freeze to death," he said. "It's really uncomfortable to live like this. I don't think they sleep too much." When Ensley got out of Providence he returned to the streets. He didn't like camping, but he got kicked out of a shelter. He sometimes hears voices urging him to go through doors to investigate problems. At the Anchorage Gospel Rescue Mission, he heard someone calling for help in the women's dorm. He went in, breaking the rules, and was ejected from the shelter, said Choices therapist Jason Robinson. But now Ensley had someone new on his side. Robinson followed him through the camps, winning his trust as a therapist. He convinced the shelter to let him back. He looked for an apartment he could call his own. That extraordinary work, and broader solutions on the horizon, will be the subject of my next column. Charles Wohlforth's column appears three times weekly.